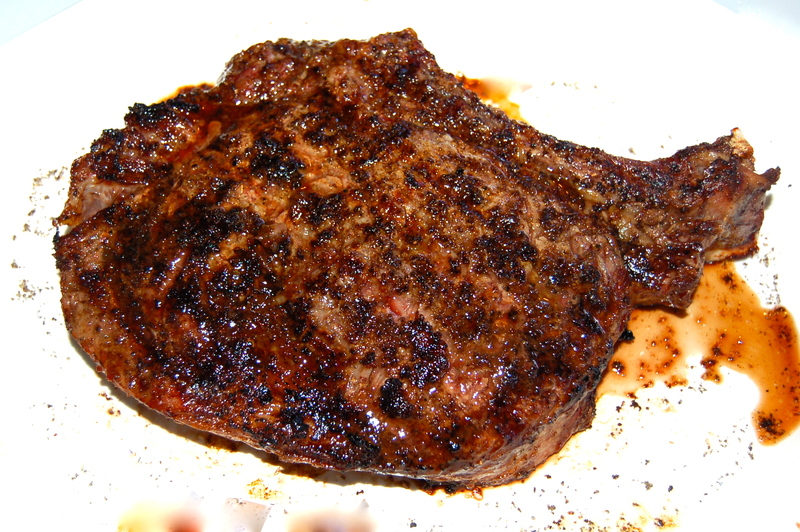 The difference between what is called a Rib Eye and a Cowboy Steak are a few inches of bone left on the latter. Ridiculous geographical colloquialism! Whatever it’s called, it’s a delicious cut of Beef. This beauty was grilled outdoors, being extra careful not to overcook. The internal instant thermometer was my able assistant. When it reached 120 F, and that took a total of 15 minutes or so (which included 5 minutes on the cool side of the grill), off the Cowboy came. After an adequate resting period, it was still what’s called “bloody rare”. 1. Turn on two burners of a three burner grill. Heat to 500 degrees F. Lay the Steak diagonally on the hot side & grill with the lid down for 3 minutes, turn on the diagonal (for sear marks) & grill for another 3 minutes. Turn the Steak over & repeat the procedure. Move the Steak to the unlit side of the grill, close the lid & cook until it reaches the temperature of 120 degrees F, for rare, or as you prefer. 2. Allow to rest for 5 to 10 minutes before slicing.